Pulling your four-year-old away from Sesame Street and toward the breakfast table as they enthusiastically shout the number “4” is no easy task—and if you happen to have a puppet or two at home, then you really know the appeal they hold for children. Some colorful fabric, googly eyes, and a kooky voice give these simple materials life and result in nonstop smiles and giggles—and they’re great for teaching empathy to children. “Children build empathy from the time they’re born—and around the four-year mark, they begin to truly grasp that not everyone will feel the same emotions all the time, meaning their empathy skills begin growing rapidly,” says Taunya Banta from KinderCare’s Education team. Empathy isn’t always easy to build, but puppets actually make it a lot easier (and a lot more fun). 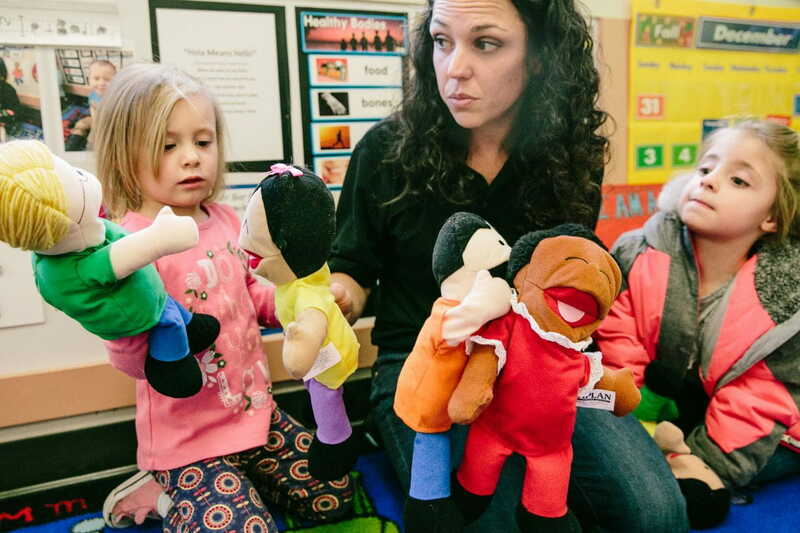 Those quirky voices draw kids in, while guided storylines encourage kids to think about the characters’ predicaments and how they would feel if they were in the puppets’ positions. Eventually, children start using empathy when it comes to their classmates, siblings, and yes, you too, parents! We have fun with puppets all the time in our KinderCare centers, but our four-year-olds are in for a real treat this week as they create their own puppet friends! This activity goes beyond simply drawing a funny face on a bag—teachers encourage kids to really think about who their puppet is. Is the puppet a grown-up or a child? What is the puppet’s favorite and least favorite thing to do? By thinking up a new character with its own interests and traits, children are reinforcing their understanding that everyone has different likes and dislikes, which leads to the realization that people can have different feelings about things—along with a better grasp on their own power. “One of those ‘a-ha’ moments for children is when they realize not only that people experience different emotions, but also that their own actions have the power to make people mad, sad, or glad,” explains Banta. We’re keeping the focus on empathy going in our centers, but there’s no reason you can’t help build your child’s empathy and kindness at home, too. Check out our short and sweet how-to ideas below! Avokiddo Emotions features a playful cast of animal characters to dress up, feed, and care for, who all have animated facial expressions depending on their emotions. Dr. Panda and Toto’s Playhouse is another good pick, featuring a very sweet (and very emotive) little turtle named Toto for your child to take care of. 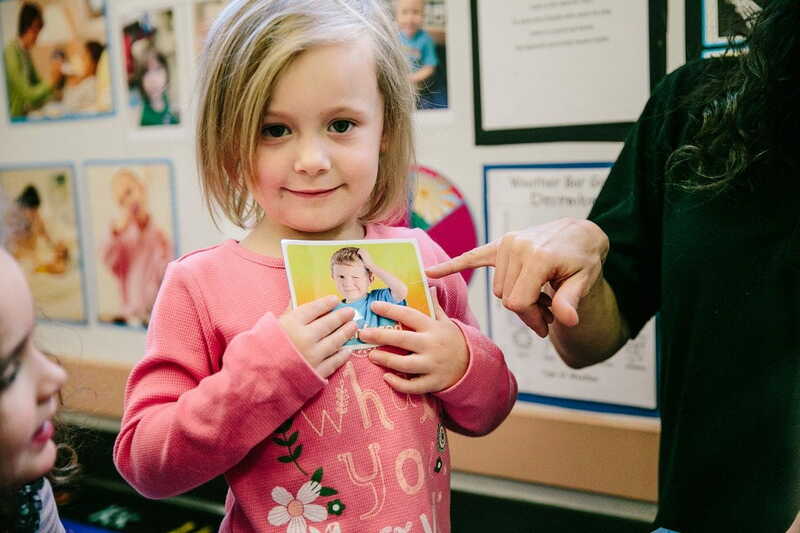 At our centers, we use feelings magnets to help children learn about and name different emotions, which makes learning empathy much easier—and you can do the same at home! Make photocopies of pictures of your child showing different emotions (happy, sad, mad, etc.) and glue them to index cards, then write the name of the emotion your child is expressing on the card. For this one, any book will do (although there are some great books about feelings out there that you can find, too). As you’re reading through the story, stop to ask your child how they think the character must be feeling. How would they feel if they were in the character’s situation? In your interactions with others throughout the day, try looking at things from their perspective and seeing their viewpoint. Ask yourself why the person is responding with a certain emotion, and work to understand their motivations. When you model empathy yourself and encourage your child to do the same, they’re more likely to develop empathy, too. Ship Shape: Make a Colorful Tugboat & Build His Imagination! With a real passion for learning, Pre-K kids are getting ready for the world. Learn how KinderCare prepares your Pre-K child for kindergarten...and beyond!